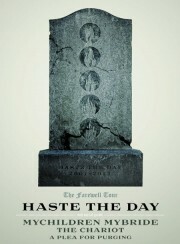 Indiana christian metalcore act Haste the Day recently announced that they would be splitting up after one final tour. This marks the end of a 10 year career for the band. For their final tour Haste the Day will be teaming up with Mychildren Mybride, The Chariot, and A Plea For Purging. Haste the Day to release "Best Of The Best"